Officially, Small Business Saturday falls on the day after Black Friday. That said, I enjoyed my own Saturday celebrating small businesses—hopping about to a half a dozen in the matter of a day. There’s so much happening in Washington that it’s great to get out there and see it—and it’s even better on a particularly warm and sunny winter Saturday. The day began with a workout, as we took a 9 a.m. grand opening class of the Dailey Method, a new barre studio on 12th and U Street. Emily, who is always prompt but rarely takes barre, met me there. On the way out, we were treated to goodie bags and bottles of Gouter, a women-led small biz that makes alkaline tonic waters. They’re the perfect refuel. Then, we were off to Union Market for a full-on morning as yuppies. We stopped by Salt & Sundry, which turned out to be hosting a pop-up of Still Life Terrariums, which just might make the most unique gift this season. Then, we visited Lab 1270, the new incubator for small businesses that’s located just off Union Market. There are all sorts of shops, plus a vending machine of fresh-pressed juices from South Block. Co. as well as one for greeting cards from Cherry Blossom Creative. We nearly cleaned out the entire stock of S3 Active, which sells high-end athletic and athleisure wear under the motto #SweatSexy. After working up an appetite, we made our way to the Dolcezza Gelato Factory, which was hosting a pop-up brunch by Gravitas, a forthcoming restaurant concept from Cheff Matt Baker. But first, coffee. As I’m a snob about my black coffee, I ordered a Dulce de Leche latte, as I’m confident the Argentines behind Dolcezza Gelato do dulce de leche well. It was absolutely delicious. 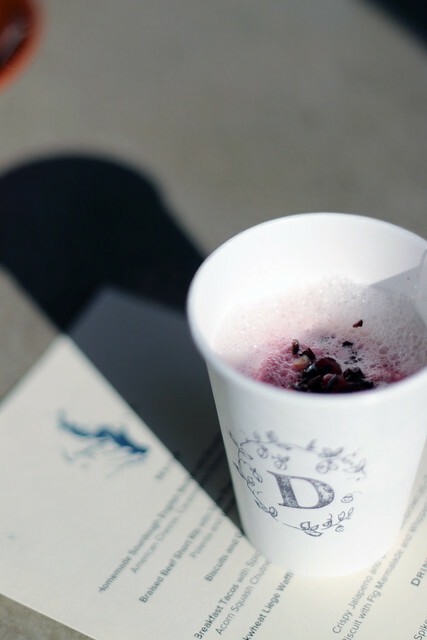 My indulgence in beverages continued with a Pomegranate Mimosa made with bubbly and Dolcezza pomegranate sorbet. It was delightful. Meanwhile, Emily tried a Bloody Mary served with Gordy’s Cajun Okra rather than a pickle. Emily is a Bloody Mary connoisseur and this one hit the spot. There were five brunch options, served on paper plates, at the pop-up brunch, which was a preview of a forthcoming restaurant by the name of Gravitas. I’d hosted a pop-up dinner with Matt Baker for Havenly and Kit & Ace, and had enjoyed the experience. 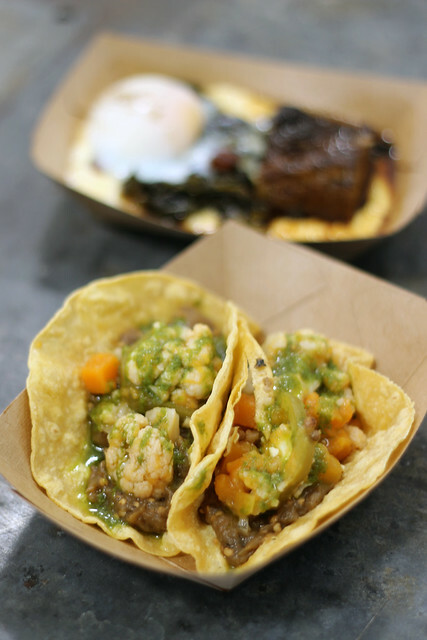 We decided to share two dishes, the breakfast tacos and the short rib. The breakfast tacos were really, really good—and really, really messy. The corn tortillas were filled with roasted scrampleted egg plant, cauliflower and acorn squash chutney and covered in salsa verse. The dish was both gluten-free and vegan, and delicious nonetheless. Our second dish was equally delicious and messy. 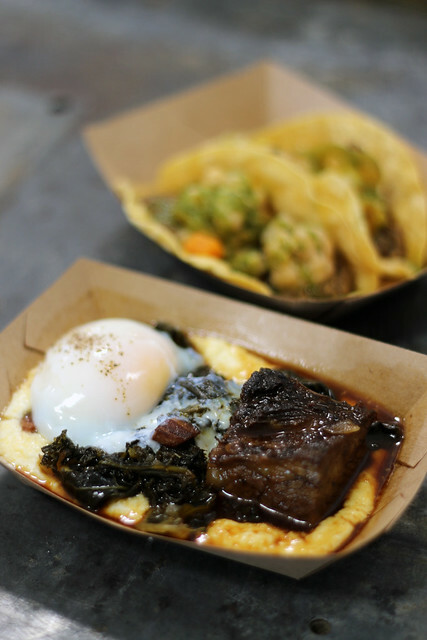 The braised beef short rib was dense and hearty, but did not exactly pull apart like most short rib dishes. It was atop with marscapone whipped polenta, which was incredibly creamy and flavorful. 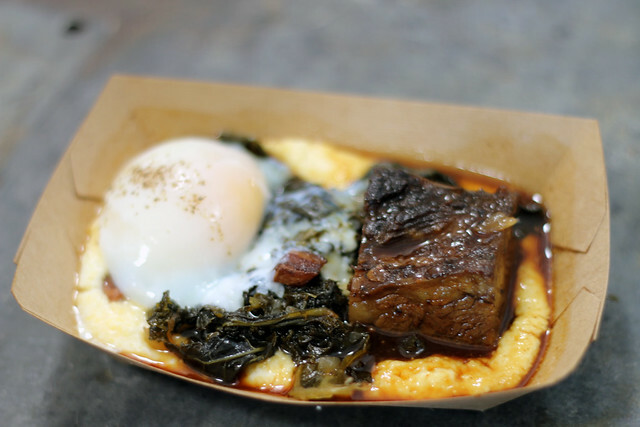 The dense dish also has bacon-braised kale and a slow poached egg. It was hard to share, but we were among friends, so we dug in. We were drooling at the hash browns coming off the line, so we had to give them a go. 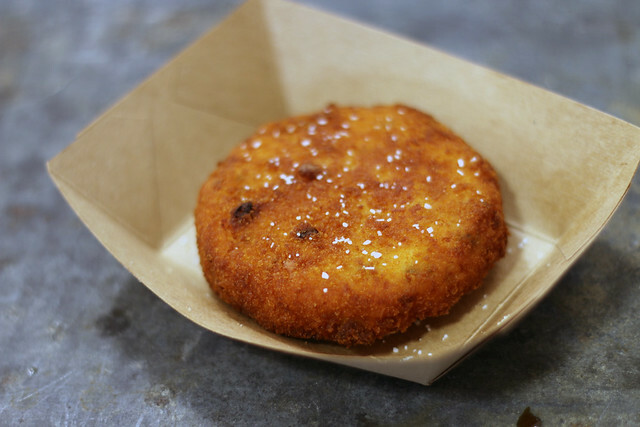 The enormous potato patty was filled with moist, melty cheese-and-potato with a bit of spice. The cheese was gouda and the spice came from crispy jalapeño. These hash browns were perfectly breaded and crispy on the outside, and moist and smooth on the inside. All in all, Gravitas was a unique, delightful and hearty brunch experience—we had no problem eating standing up! Unfortunately, this was a one-time pop up, but you can learn more about Gravitas on the website. We’ll look forward to the restaurant opening next year! 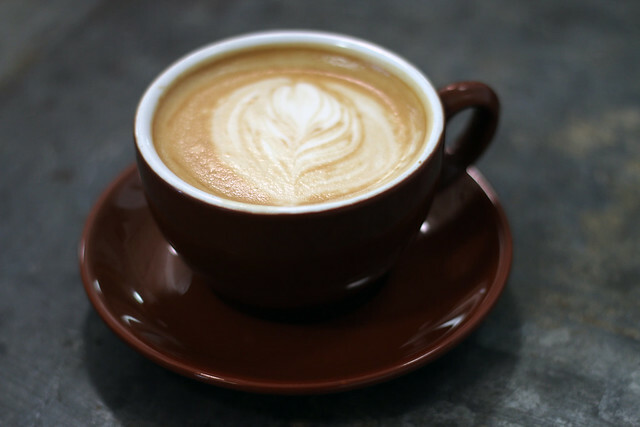 Or, drop by Dolcezza Factory for coffee and gelato—the gelateria often has pop up events and dinner parties. 55o Penn Street N.E.